With more than twenty years of restaurant experience, Buffalo Tom knows food. A Buffalo native, Tom also spent ten years sharing his recipes in Ft. Lauderdale, FL with tourists from all over the world. After years of pleading from friends and customers, Buffalo Tom finally began sharing his gourmet hot sauce with the public in 2002. After a brief hiatus from production late in the decade, Buffalo Tom's has returned and is now focused on national expansion. While Buffalo Tom's website promises new products in the works, I'm focusing this review on his signature Gourmet Hot Sauce. This burnt orange sauce is packaged in 10 oz. glass bottles. The label is hilarious! Check out Tom astride that buffalo (above). "Yeah Baby!" The sauce is slightly thick for a hot sauce, but still thin enough that it pours very quickly from the bottle. Buffalo Tom's Gourmet Hot Sauce is a cross between a traditional Buffalo wing sauce and a standard cayenne pepper/vinegar blend. It has a sharp vinegar tang and plenty of spice. Because it's a hybrid recipe, the sauce is very versatile. It works as a wing sauce or with any other dish that one would typically add a dash of cayenne to. I used Buffalo Tom's sauce for smoked chicken this weekend. I hot smoked a whole chicken (separated) and dipped each piece in Buffalo Tom's. I then threw the bird back on the smoker to let the chicken finish cooking in the sauce. I served additional sauce on the side for dipping. The sauce loses a bit of its heat after being cooked, but not much. It still packed plenty of tangy, spicy flavor. It complimented the mild, smokey chicken very well. Most of the chicken, especially the dark meat, was flavorful enough that I didn't need additional dipping sauce. I did, however, add another shot of Buffalo Tom's to the pulled breast meat. 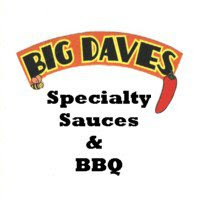 Buffalo Tom calls his sauce, "The Only Real Choice." While that may be a bit of hyperbole, his Gourmet Hot Sauce is versatile (and tasty) enough to be your choice on most occasions. It works well on pizza and potatoes in addition to chicken. 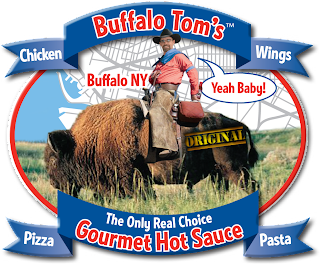 I still prefer standard jalapeno or cayenne sauces for Mexican dishes, but Buffalo Tom's is pretty good on just about everything else. 1 Response to "Buffalo Tom's Gourmet Hot Sauce"
I bought several bottles of Buffalo Tom's Hot Sauce a while ago and passed out to friends here in South Carolina. They loved it! Great on chicken and many other foods including eggs for those who prefer their breakfast eggs that way.